View of the west front of Ripon (formerly Rippon) cathedral, Yorkshire. A monastery had been established on this site around AD660, and a parish church was built over it during the Norman era. The entire structure was substantially rebuilt between the mid-12th century and the reign of Henry VIII. 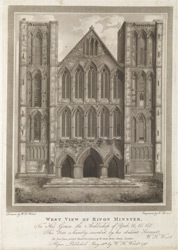 Architecturally, the cathedral showed the influence of many different styles and eras: the twin towers of the west front were a mixture of Norman and Gothic Perpendicular features. They originally had spires on top, which were removed in 1664. In the early 18th century Daniel Defoe commented: "The church is still standing, tho' the monastery and hospital are suppress'd, and the canons and choir are maintain'd at a much better rate than as above, for they now eat as good beef, and drink as good Yorkshire ale, as their neighbours."